How is that for an old game review? Instead of the Pokemon game, I would like to talk about my favorite game since I was young. 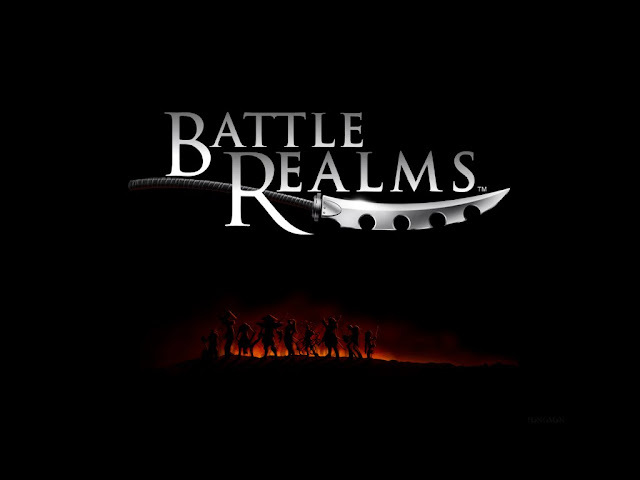 Have you guys ever heard of Battle Realms and it's expansion pack, Battle Realms and the Winter of the Wolf? If you haven't heard of it, you should really look it up. You know how you get to train peasants into soldiers and gather resources? This game is very similar. 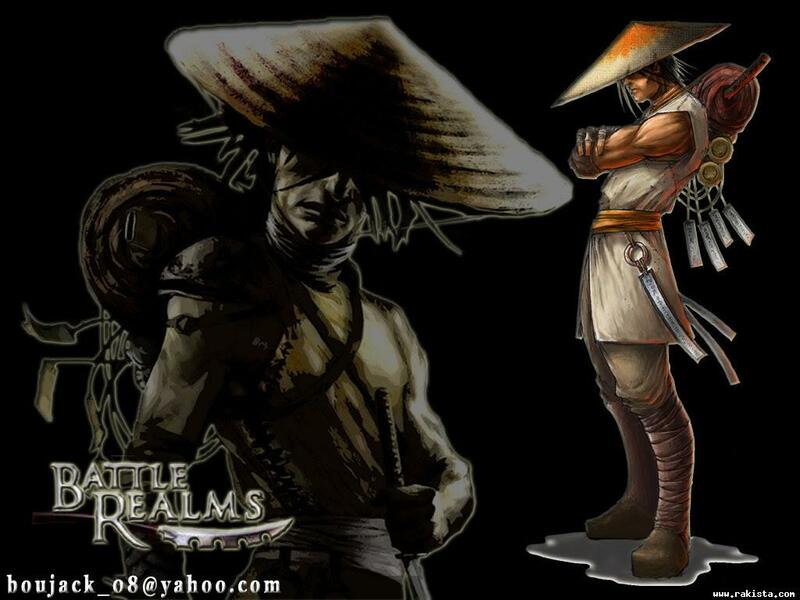 In the original game, you play as Kenji, a warrior. From the very beginning of the game, your actions depicts the clan you will play as. If you choose to save the peasants from the soldiers, you get to join the Dragon Clan. If you choose to kill the peasants, you will join the Serpent Clan. The game features four different clans, Dragon Clan, Serpent Clan, Wolf Clan and the Lotus Clan, but the story mode allows you to join two of the said class. Fret not, you can always play any of the clans in the skirmish modes. The ancient Dragon Clan prizes honor above everything else. They are Yang followers with honor as their symbol. Their warriors seek to become one with their weapons. Due to their devotion to honor, the Dragon deity assists them during times of great peril. 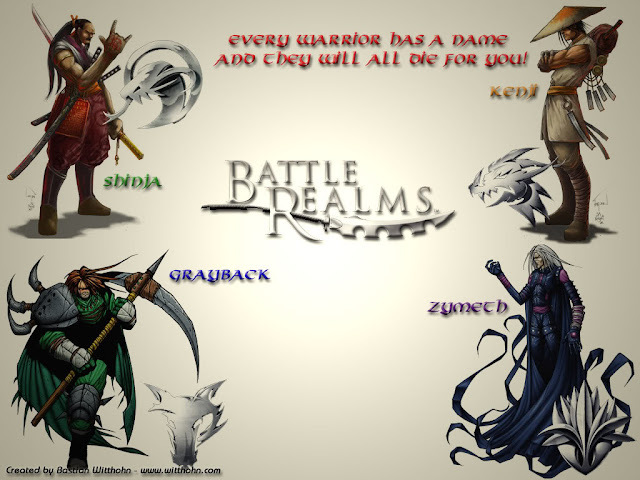 Strategy:The Dragon clan rely on a balanced army of melee and ranged units. These wood-elf like Wolf Clansmen prizes freedom above all else. They are Yang followers with freedom as their symbol. Unlike the other clans, they have no cavalry, nor do they have healers. They feed the horses to their wolves, which accompany them and partake in their battles. Their wounds knit surprisingly fast, even more so with the use of herbs. They know some magic, and much of what they do know is tied to nature. Wolf Clansmen are down to earth, hardworking people, and take a delight in nature. They are also known for their use of shale as their armor. Strategy:The wolf clan have unmatched melee units and powerful missile troops,they rely on brute strength and numbers to achieve their goals. The Lotus Clan is the remnant of a Yang Clan of old, but it is now a Yin Clan. Lotus clansmen are Yin followers with corruption as their symbol. They follow the Forbidden Path, which focuses on death and decay. Their religion centralizes around three ancient brothers, now long gone, who tended the Tree of Corruption. The Lotus Clan's strategy is based on their immense understanding of magic, which translates to unit abilities and Battle Gear. Strategy:The lotus are the masters of magic,they rely on heavily on their Warlock units as this is their source of power defensively and on the assault,they work best with mostly ranged units and a few melee units to distract the enemy's melee units. After the release of the expansion pack, Winter of the Wolf, you start off playing a different story, but in the wolf clan's perspective. This introduces more characters and upgraded buildings. It is all very fun. It is really a pity that they have stopped making the game. It would be extremely awesome if they decided to make another expansion pack, preferably one that plays in the perspective of the Lotus clan, my personal favorite. Till the next time, ciao! Article by: Anil the fire trainer Dass.